I have recently had quite a few students ask me why their quilts aren’t square, why their quilts pucker, what am I doing wrong? More often than not the problem is contributed to accuracy in cutting the fabric. First things first, you need the proper supplies. A cutting mat, a rotary cutter with extra blades, and quilting rulers and square rulers for squaring up. Oh my, and the most important ingredient in this recipe, Fabric! To begin properly, you will want to press all wrinkles out of your fabric. You may be wondering if you should wash your fabric before you begin cutting and piecing, that is a personal preference. I do wash anything that is colorfast, and in those quilts I am sure to wash all fabric due to shrinkage factors. I want to be sure that all fabric in a quilt has been handled the same way. If one fabric is washed, I will then wash all fabric for that quilt. I do not hesitate to repeat myself on this point because it is a very important instruction. There are right and wrong ways to press your fabric. 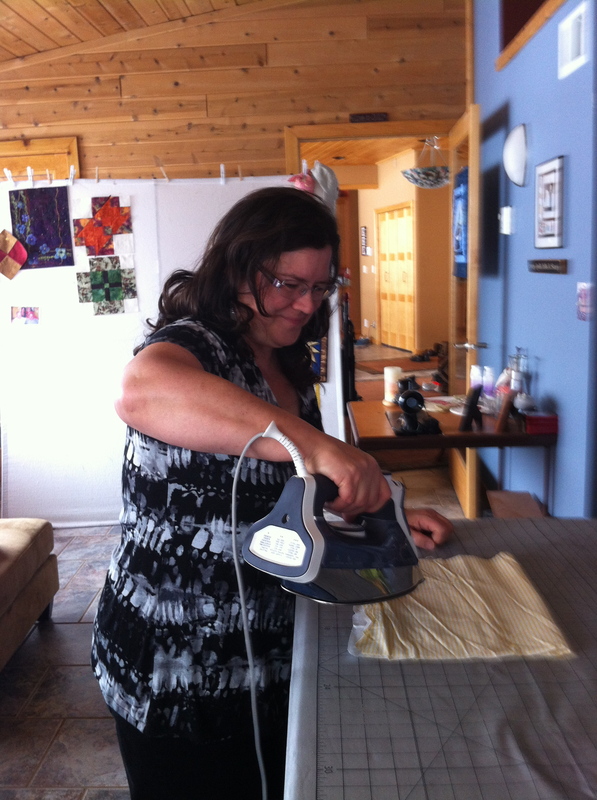 As you can see, Pam is pressing her fabric and has it folded over. This is alright, but to be really efficient she will want to open up the piece and simply iron it open to avoid any creases. When fabric is folded like this it is often difficult to see if there are any creases or folds that you are ironing into the fabric. Once fabric is open you can see wrinkles or creases. If you have difficulty getting them out with dry heat, feel free to spray a little water on problem area and press. you will want to be sure you are cutting your fabric on grain. do this is shown in the photos below. 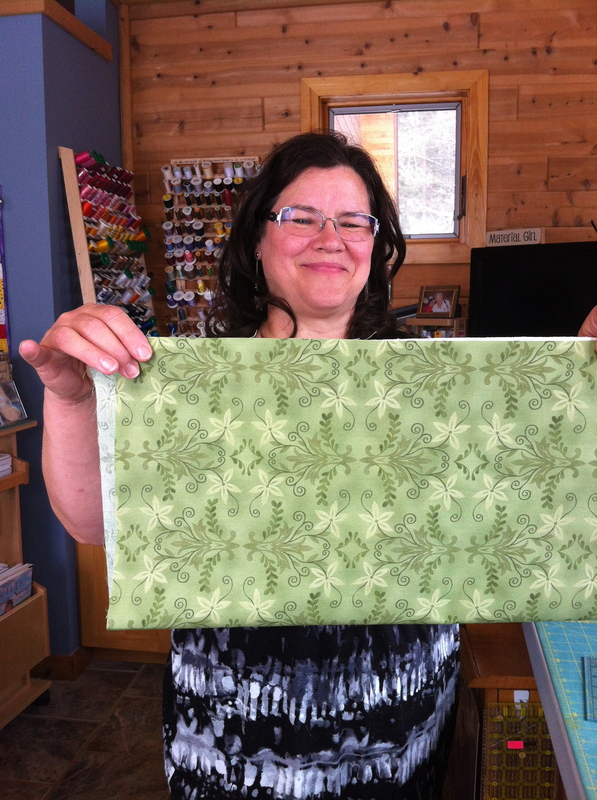 Pam has lined up the salvage and shifted the fabric so the fold lies nicely and doesn’t have any twists in it. If you look to the left of her fabric, you will see that the cut edge is uneven. You will be using the folded edge to line up your ruler and straighten that edge. Do not use the salvage side as that edge is not as consistent as the folded side. Line the Folded edge up with a line on the 24×6 inch ruler. Once the edge is straight, at a 90 degree angle from the fold, you will now cut off the salvage. You may wonder why the salvage is cut off. The salvage does not shrink or give at the same rate of the rest of fabric. If you do not cut it off, it will be part of your quilt and after a washing you will find puckering that you won’t be happy about. 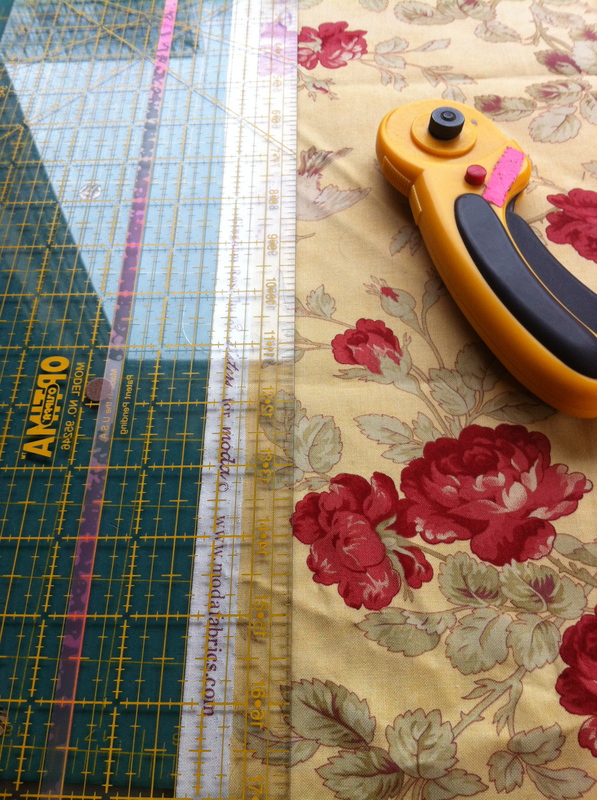 As you begin to cut your fabric, it is important to remember not to use your mat as a measuring tool. Mats can become warped, and they can be inconsistent. You also do not want to use them as measuring tools due to the fact that many measurements in quilting are common measurements which will leave ruts in your cutting mats after multiple uses. This will cause inconsistent cuts and damaging fabric. You Simply use the mat as a cutting surface and actually use your ruler for measurements. This may sound confusing, so I will walk you through it and include a photo. You will lie your fabric with the side you desire to cut on the left side of the mat with the fabric lying to the right ( if you are right-handed, reverse if you are left-handed) use the measurement you are in need of on the ruler, Lets say 1 inch for demonstration purposes. line up the 5 inch line with the left edge of fabric, hold ruler with your finger tips on left hand, hold rotary cutter in right hand with your arm resting at a 90 degree angle at your side. you want your arm to move naturally forward so that your blade does not tip to the left or the right, this will cause uneven cuts if it tips to either side. You will use the edge of the ruler as your guide, your body positioned so that your arm isn’t in front of your body cutting. Your arm is at your side, your body is positioned so that your arm moves freely forward as you cut. When the cut is complete, leave ruler on fabric and pull the fabric to the left away. You do this in case your fabric hasn’t been fully cut through. In this case you will still have your intended strip still in place under the ruler, you can now proceed to recut that area that may not have cut accurately or incompletely. give a very special thanks to Pam, one of my students, for being my model.